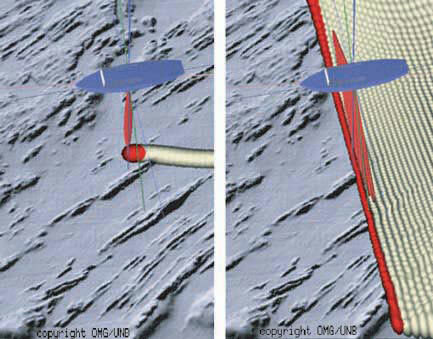 Multibeam bathymetry sonar is the relatively recent successor to echosounding. About 30 years ago, the Navy developed a new technology that uses many beams of sound at the same time to cover a large fan-shaped area of the ocean floor rather than just the small patch of seafloor that echosounders cover. These multibeam systems can have more than 100 transducers, arranged in precise geometrical patterns, sending out a swath of sound that covers a distance on either side of the ship that is equal to about two times the water depth. All of the signals that are sent out reach the seafloor and return at slightly different times. These signals are received and converted to water depths by computers, and then automatically plotted as bathymetric maps. The data acquired by multibeam systems are much more complex than single-beam surveys; this means higher resolution is possible, but also that more involved signal processing is necessary in order to interpret the data. Multibeam systems produce high-resolution bathymetry data throughout the survey area. Since they acquire dense sounding data both along the ship’s track and between the track lines, they can provide 100% coverage of the seafloor. Multibeam bathymetry sonar is used to locate topographical features on the seafloor such as sediment ridges, rock outcrops, shipwrecks, and underwater cables. Ships also use this technology to avoid areas that would endanger their vessels or gear, to find fishing grounds, and to precisely map the seafloor. Objects as small as one meter long can be located with this technology. Multibeam bathymetry sonar is a valuable tool for scientists hoping to learn more about seafloor habitats in the hopes of conserving them. 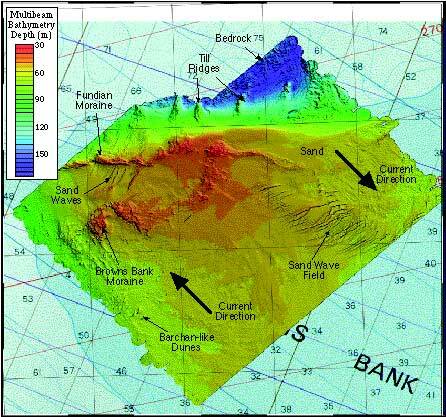 Multibeam bathymetric image of western Browns Bank, western Scotian Shelf. Photo Courtesy of Gordon Fader, Geological Survey of Canada (Atlantic) and the Canadian Hydrographic Service. WHOI- Dive and Discover, Multibeam Bathymetry – The Successor to the Single-Beam Echo sounding.